We can help you achieve your artistic vision and purchase custom art with confidence. From heirloom-quality furniture to driveway gates to art for your walls and gardens, we partner with established and emerging artists to create custom works that are of exceptional quality and enduring value. Because we can find the right artist to create the right pieces within your budget, at no additional cost to you. We are uniquely qualified to guide you through the process of commissioning custom works of art. We have built our reputation for creative solutions and professionalism based on many years of design studio and gallery ownership, and thorough knowledge of fine art and the decorative arts market. Art is our personal passion, and we enthusiastically bring our experience and creative energies to each project. Let us focus our energies on acquiring your next work of art. Contact us for more information. 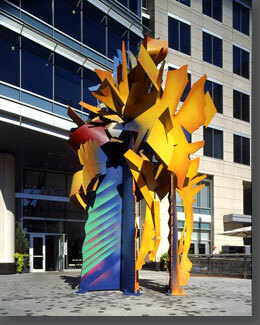 Read about our recent public art commission with Albert Paley.